"An Encyclopaedia of Indian Archaeology" is a significant reference work on archaeology in India. 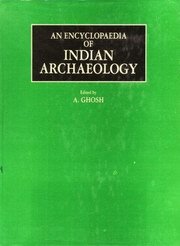 It is an authoritative work of permanent value in which the knowledge and expertise of Indian archaeologists from the Archaeological Survey of India, universities and other institutes have been pooled together under the editorship of the late A. Ghosh, former Director-General of the Archaeological Survey of India. The "Encyclopaedia" has been planned in an ambitious manner; it is not merely an alphabetical listing of entries with sketchy information on topics. Volume 1, which deals with certain broad subjects relating to Indian Archaeology, is divided into twenty chapters, alphabetically arranged. Each chapter is further divided into sections and subsections containing independent and self-contained essays. For example, in the chapter on "Cultures," detailed information can be found on various cultures in India; the chapter on "Basis of dating" contains articles on archaeological dating, archaeomagnetic dating, 14C radio-carbon dating, numismatic dating, palaeographic and epigraphic dating, thermoluminescent dating, etc. For those interested in getting further information on the subjects and in looking into the original sources and references, each entry also carries an exhaustive bibliography. Volume II is the Gazetteer. It contains basic data and information on all the explored and excavated sites in India along with reference to published reports and/or notices on each.